I’m a story teller, and I love my calling, but I hate to tell this one. Our next door neighbor, who has since deceased, warned me that if my bull ever got out that she would personally shoot it. One day I watched him as he knocked a hole in the barn and raced through the fence heading for another herd a mile away. He had to go right by this neighbor’s house and proceeded to tear up her garden with his horns. I heard one shot and knew it was not the neighbor lady because she was still inside when a second shot hit him in the neck. Any regular animal would have died on the spot but the white bull didn’t. I was neither committed to animal rights in those days or to a vegetarian way of life. It took me all afternoon to get him back to the barn because he still wanted to visit the cows bellowing on a distant hill and their bull’s mooing was stirring his instincts to fight for possession of the neighboring herd. By the time my sweet wife got home from work he was in the horse trailer and ready to take to the slaughter house. He continued to answer the bellowing bull belonging to the distant neighbor with long lonesome bellows, “Moo-aghs” long after he was in the trailer. My wife helped me drive him 50 miles with two slugs in him to the slaughter house. I had grown up on a farm but never participated in any of the annual putting of meat in the deep freeze as I had no stomach for it. Now I knew that all I had to do was to cut off any feelings coming from my heart and put the wounded animal out of his misery. At the slaughter house, the owner reassured me the beast would feel no pain but would be put down with a small caliber, single shot to the brain. A thud of the bull hitting the floor startled my wife and she panicked. I asked the slaughter house owner if he had shot the bull and he reassured me the ordeal was over. When anyone in our area comes down with a severe illness, a fall, a lightening hit or a car wreck they are immediately taken as speedily as possible to a hospital where they receive the best of care. Any pain or discomfort is masked by pain killers and kind treatment and every attempt is made to make the patient as comfortable and safe as possible. With animals, this is not the case. There are more than 94,000 cattle slaughtered every day in the US daily along with over 6,700 sheep and lambs. A young friend of mine was having a fit about how little medical coverage she had for her baby. It seems like nobody cares about how much medical coverage animals have or if they are protected from the self-centered human throng. Many of them profess to be Christians but I guess they cannot read because they never take into consideration the fact that killing a bovine is equivalent to killing a human being and killing a sheep is as if they cut off their dog’s neck. (Isaiah 66:3) As one man said, “Either they do not know the scriptures or are afraid to tell their congregation what God says so they make a mockery of God and an animal farm no laughing matter. To hear Christians this kind of selfish positioning is either insanity or blatant disregard for God’s word. How can we continue to kill animals for their flesh when Jesus says, “And except those days should be shortened, there should no flesh be saved: but for the elect’s sake those days shall be shortened.” (Matthew 24:22) This is no time to be enjoying leg of lamb when the lamb would enjoy having its own leg itself and this is not time to be eating veal steak when the whole creation is at stake. Who is worrying about whether animals on their way to slaughter are nervous, stressed and full of fear? Who is speaking for them? Just as we have people crying out to have faith in God we need to reassure all the creation their faith in God is not misplaced because it is demonstrated by some of us who are His followers. As a minister of the gospel, I must ask: how is it possible that those who were created to guard and protect the creation have become the creation’s worst enemy and its destroyer? How can we claim that God is love as we pump another bullet into a wounded deer? Or dump a house cat out of our car to “forage for itself?” Few animals compare to Felis domesticus or the domestic housecat, have cooperated so greatly with humanity. This may be because the common species has a genetic tendency towards living a tame life with humankind. Releasing one causes it to revert back to a wild creature and killer. It has been living with people for 9500 years at least. 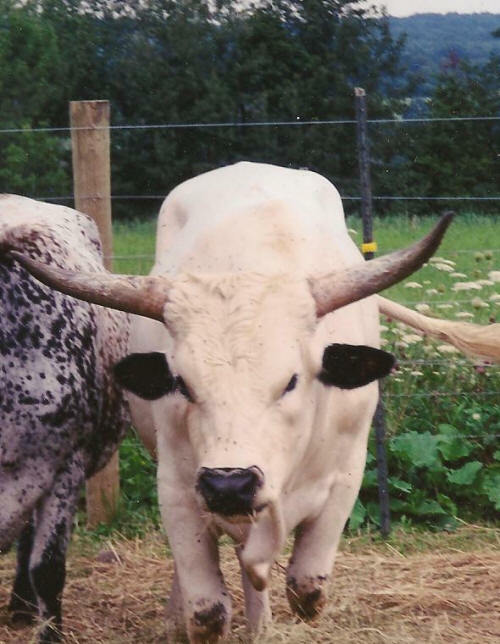 I thank God that through Jesus Christ, “Whom God hath set forth to be a propitiation through faith in his blood, to declare his righteousness for the remission of sins that are past, through the forbearance of God.” (Romans 3:25) But I will always remember the white bull.